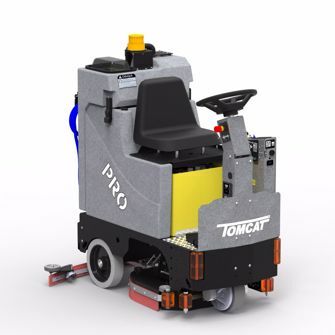 Tomcat’s Pro MicroRider floor scrubber has the smallest footprint with the highest power motor – they are built to last. It would make a great addition to just about any facility – school systems, healthcare, warehouses, grocery, retail, arenas and many others! The 36 volt system runs for a full shift and makes your job easier with Traction drive, a powerful all-gear transaxle to make climbing ramps easier and operation effortless. Not to mention it has a comfortable cushioned seat. You can choose from three different scrub head types, all with different features and benefits. Disk – has the lowest maintenance cost, improves cleaning on uneven floors, and individually driven brushes enhance performance. Cylindrical –has superior grout cleaning abilities, it can scrub and sweep simultaneously, and eliminates dust mopping. EDGE – mainly used for maintaining and stripping floors (without chemicals), wet screens wood gym floors and boasts a 70% reduction in water usage. Scrub Path Width: 26" and 28"
Dimensions (LxWxH): 48" x 24" x 55"
Scrub Path Width: 24" and 28"